While we all know, I hope, that Rome was built by the Romans, and when exploring Rome, we rarely miss out on iconic sights such as the Colosseum, the nearby Forum and that architectural marvel the Pantheon, we miss an awful lot. This is no surprise as there are so many of them! This is where a new app called Time Travel Rome comes in. Here’s a review of this app and why you might like it. Read on to find out how to get yourself a free copy of the Android version of the Time Travel Rome app. Time Travel Rome – There are lots of Ancient Roman sites in Central Rome! 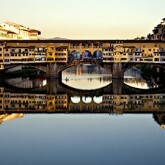 The Time Travel Rome will help you find all these sites. Not only that – the app will help you plan routes between historical points of interest – and it’ll give you a detailed run down on the ruin you are at, plus, in many cases, links to Wikipedia articles and more. For Roman history buffs, this app is a must have, I’d say. 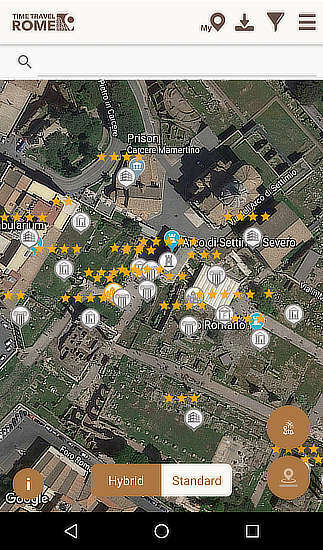 Educators may also find this app useful when exploring Rome with their students on school trips. While it appears to be comprehensive, I’m afraid I’m not able to judge how accurate the information the app provides is, but I’d be interested to hear from someone who is. The app is quite easy to use. 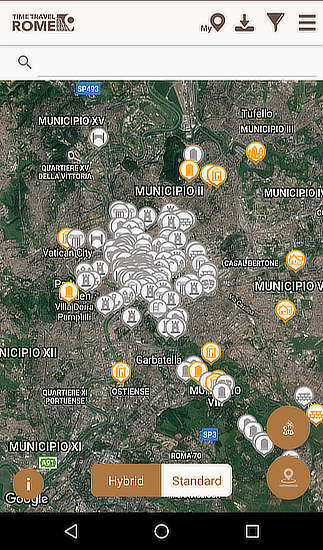 To start exploring Rome you open it, zoom in – by double tapping on Android devices or pinching out (spreading your index finger and thumb on iDevices) – and then tap on the monument that interests you. To help you choose what to see there’s a star rating system which goes from one to five stars with 5 star rated sites being the most interesting – you have to zoom in quite a lot to see the star ratings. When you tap on an icon, you are presented with a brief menu with the name of the monument or historical Roman site with What to see here or How to Get there options. Tap on What to see here and you will be taken to a page with lots of information on the Roman ruin. On the same page along with the apps own texts, there may also be a link to a Wikipedia page on the site. There are also another two page sections: Nearby which tells you what is close to you and how far away it is in kilometres and metres, plus the Ancient Texts section which has lots of information taken from historical texts on Rome. By the way, to leave this section of the app, use your Android phone or tablet’s main back button – the left facing little triangle. 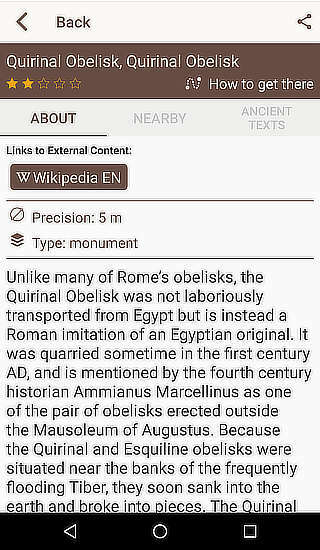 Time Travel Rome also lets you create your own lists of what to visit though this feature didn’t always work on the Android version of the app I used unless I selected sites with orange icons. The sites with grey icons weren’t added to my custom list. I’ve told the developers about this little bug. My smartphone is a bit old and uses Android 6, apparently the feature works on Android phones using version 8. If you do have problems, there are some pre-created lists of points of interest to keep you going. 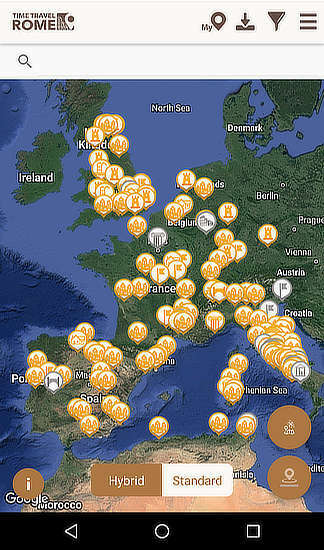 Just look at the number of ancient Roman sites all over Europe! By the way, you can also search in the app for places of interest. The app runs well on my old Android smartphone but zooming in and out can be a little slow at times. Navigation can be a little fiddly and I sometimes ended up closing it when all I wanted to do was to get back to the initial map. This problem should go away once I’m used to how the app works. I have demo version on my iPad mini and it works well. Having a bigger screen also helps, especially if, like me, your eyesight isn’t what it once was. 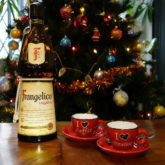 The app comes in two flavours: the very basic demo version which is free and the full blown version which at the time of writing costs €10.99 – $13 USD or £9.90 UKP. The basic version does little more than show you where Roman sites are. To get the information and other features, you need the full version. As apps go, it may seem a little pricey but for what you get, but I think Time Travel Rome is pretty good value. It’s like having a huge but not heavy history book in your pocket. The app is also being updated regularly and the developer is looking for an investor or sponsor to help cover updating and development costs. Five lucky readers of Italy Chronicles can get themselves a copy of the full Android version of the Time Travel Rome app by following @newsfromitaly on Twitter and sending me a direct message or by sending me a message on Italy Chronicles Facebook page. First, though, you’ll need to download Time Travel Rome and install it onto your smartphone or tablet. Then you’ll need to answer this question: Which ancient Roman site can be found at Largo Magnanapoli in Rome? Send you answer to me via Twitter or Facebook. The first five people to give the correct answer will get an Android app redeem code. Have fun exploring Rome with Time Travel Rome. You can find out more on the Time Travel Rome website. To get a copy, visit Google Play or the Apple iTunes or App Store. Would I use this app when exploring Rome? I certainly would. Disclosure: I received a free copy of the Time Travel Rome for review purposes.